In the cosmos of visual art, artists manipulate different amounts of materials and pigments to create countless works of art with varying light and dark effects, depending upon how densely the media is applied. 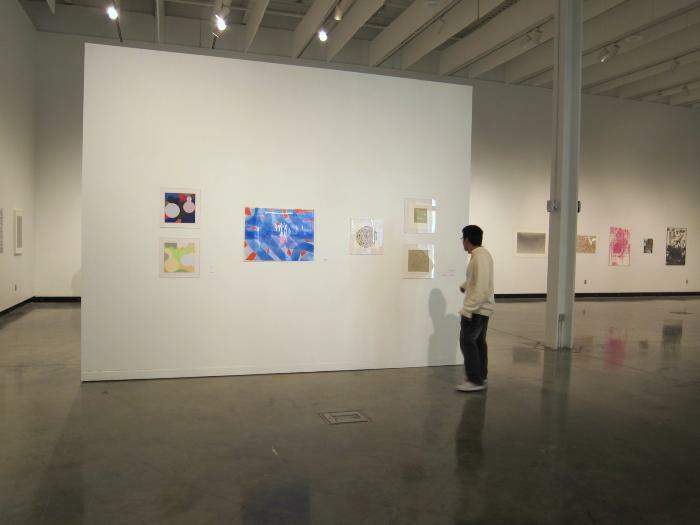 Artists use varying degrees of calculation or improvisation in order to mediate between controlled action and chance. Some artists sparingly place marks on the picture surface so that the viewer must focus on each mark’s relationship to the others, as well as to the surrounding undrawn space. In such drawings, density is restrained. 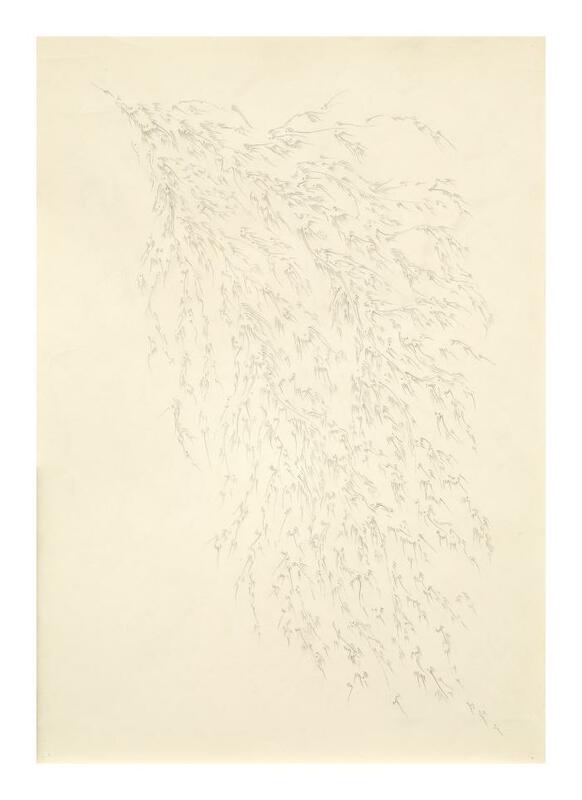 For example, Nishijima Kazuhiro placed short graphite lines that appear as wispy trails across the paper in three drawings (2002), which variously evoke tufts of grass, ripples of a cloud or a pool of water, feathery seaweed or the earth’s topography as seen from a great distance. 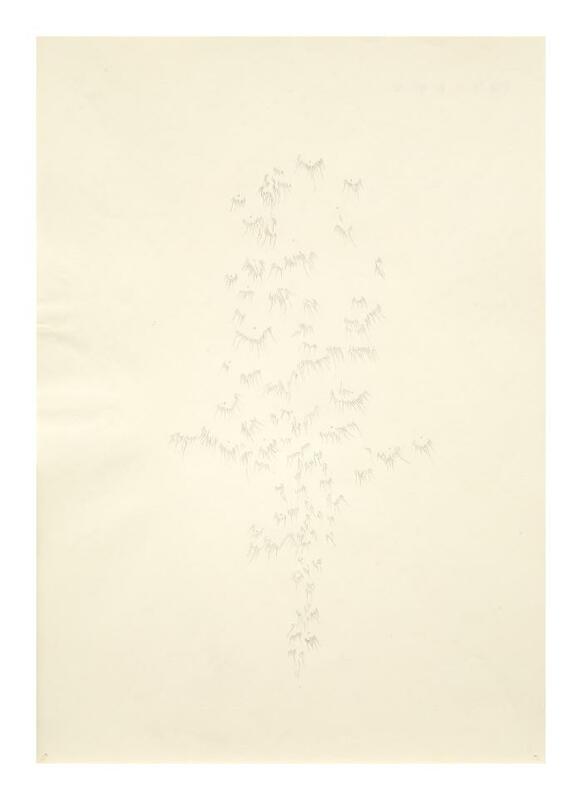 In Hovey Brock’s delicate watercolor (2001), an aggregate is comprised of faintly tinted dots; each varies in degrees of translucency against their bright white background. Morgan O’Hara’s three Live Transmission drawings (1997) feature irregular linear tangles looking like loose or tight clusters of wire or magnetized iron shavings. Skillfully balancing improvisation with deliberation, she energetically scribbles to mimic the hand movements of performing musicians. Her distinctive drawing process visually translates a performer’s rhythmic or lyrical gestures that result in precisely executed sounds. Gelah Penn commingled dark and white strokes and tones into a smoky maelstrom covering much of the paper in Colony # 11 (1989-90). 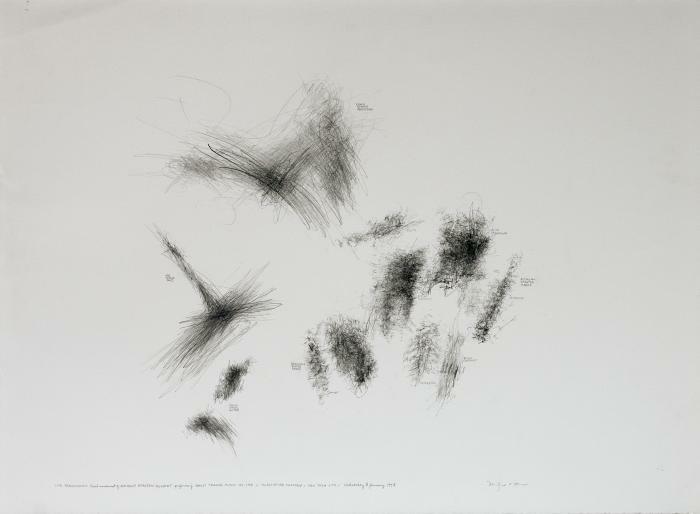 In her Whaddayamean Series #2 (1990), two tufted masses seem pulled apart by unseen forces yet remain connected by hairlike strands. These lines, appearing simultaneously strong and fragile as they cross the blankness, speak to the artist’s admirable command of line. Later, she employed a sparser artistic language: Splink #4 (2004) suggests biomorphic clusters of dark cells with tendrils, like ova attracting an army of sperm. 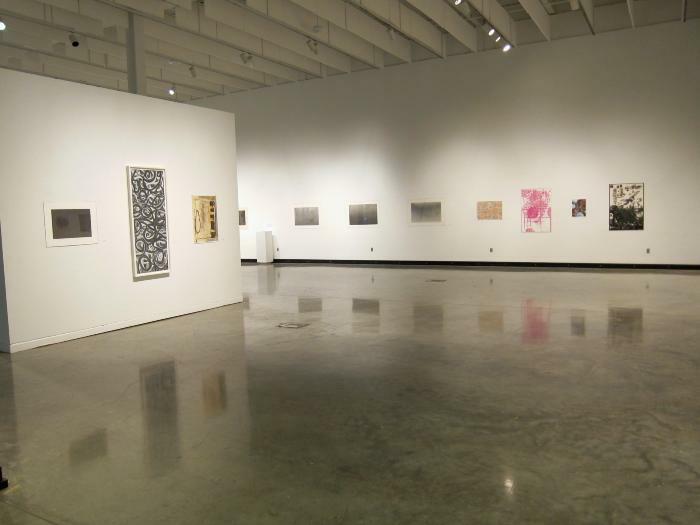 Other drawings that evoke the floating, transitory world of cellular organisms or marine life include Within/Without (2003) by Janell O’Rourke and an intriguing tentacle shape (2008) rendered by Michael Kukla. Other drawings, such as Emily Stern’s Stringed Planets (2005) and the galaxylike watercolor with gouache by David Ambrose (2008), suggest a colorful and densely populated macro universe. Inspired by disparate forms, structures and spaces crammed together in the urban environment, Claudia Sbrissa collaged vinyl, thread and marker (2007) to create a captivating colony of bright pink orbs bumping against a multitude of shapes. / Linear compositions drawn to the edges of the sheet characterize works by Ellen Kahn, Gosia Wlodarczak, and Joel Sokolov, albeit in each artist’s distinctive style. 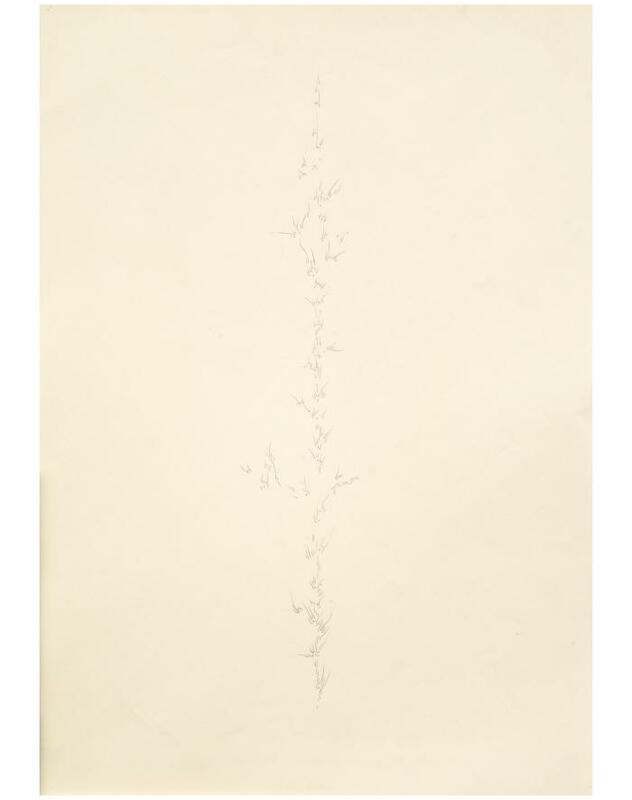 Kahn’s graphite drawing on mylar (2005) presents an overall pattern of outlined shapes recalling a small flowering plant growing in a garden. Wlodarczak’s drawing (2004-05) is a colorful network of energetically superimposed criss-crossed lines and scribbles. Unlike mere doodling or graffiti mark making, Wlodarczak’s linear accumulation is like a map of the straight or irregular paths people take as they traverse an intersection. Sokolov’s commanding oblong drawing (2007) features dark and light ribbonlike curves that loop, wind and undulate around the picture plane. 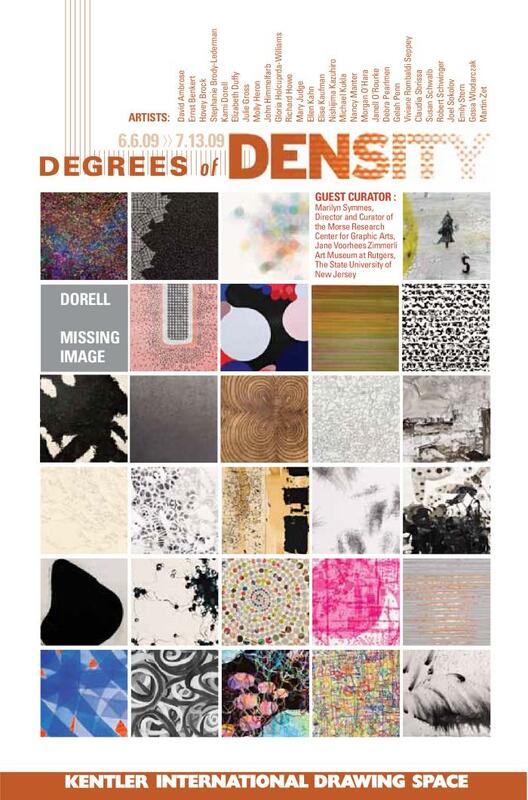 Dots, lines or shading (or combinations of these), covering the entire surface exemplify density at its most extreme. Richard Howe creates extraordinary atmospheric drawings in graphite or pastel as explorations of light and dark tonal nuance (one drawing is dated 2000; four date from 2003). As one gazes at this artist’s clustering of dots and flecks that merge into differing harmonies of subtle shadings, it is impossible to discern where he placed his first particlelike mark or stroke, and where he finished. Was it random chance or honed intuition that guided his hand for placing each touch on the paper? His compositions evoke dust, vapor or a section of the sky at dawn or at the darkest time of night. 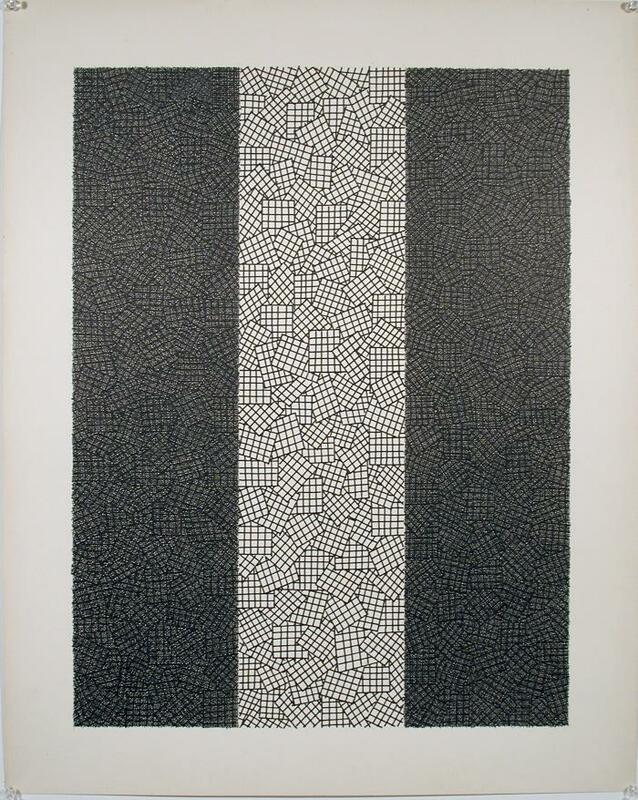 / Ernst Benkert has made many drawings according to a strict ordering system; he structured his overall black ink compositions via grids comprised of parallel vertical, horizontal and diagonal ruled lines. In Cross Field No. 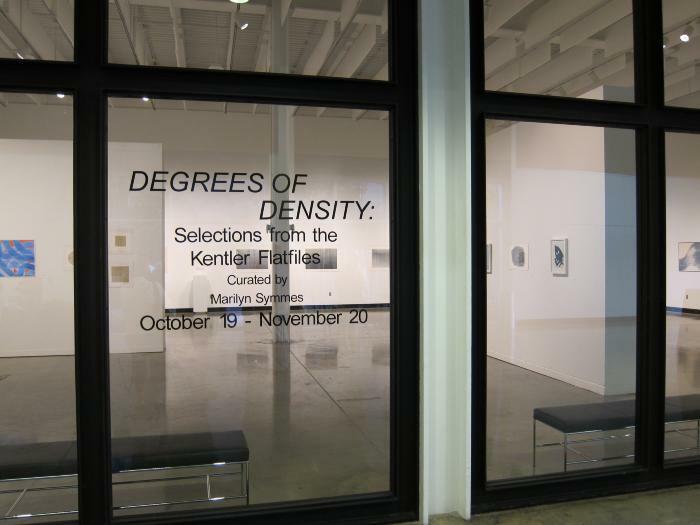 1 (1984) and Hairy Mess (1985), the closer to one another Benkert made the lines and hatching, the darker and denser the mesh network became. The artist’s mastery resides in his knowing precisely when to stop his linear applications. 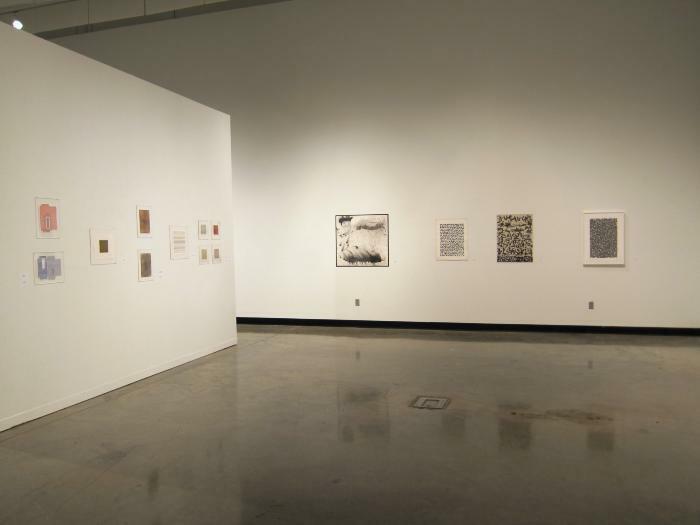 Instead of producing a lifeless, solid black, Benkert subtly animates his densest drawings by creating a visual texture; he leaves tiny highlights (from the white of the paper) glinting on the surface. 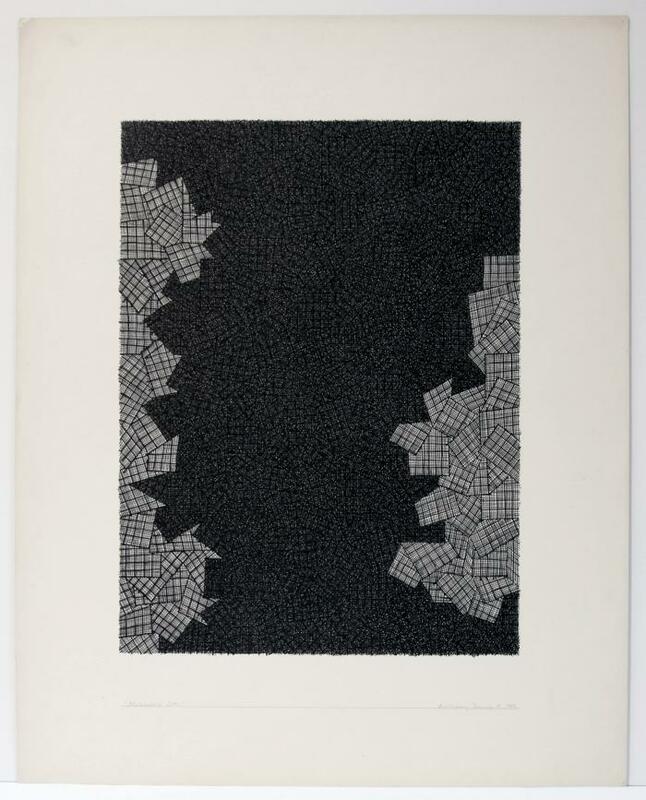 In other drawings Benkert subverted a calculated geometry defined by vertical and horizontal edges and instead varied the clustering of lighter and darker patterned modules (which look somewhat like a “plaid swatch”), as in Norvenbundel (1985), Melancholy Otto and Wolgast (1986). In Zig Zag No. 2 (1991), the artist deconstructed the grid so his all-over composition of “film strip” units and black crosses appear randomly arranged, much like a deck of cards that has fallen onto the floor. Other kinds of systemization include Mary Judge’s two untitled powdered pigment drawings in muted earth tones (dated 1997 and 2002). These offer irregular concentric rings of pin-prick sized dots suggesting a cross-section of a tree or cellular organism. Viviane Rombaldi Seppey modifies systems of geometric ordering and printed graphic design by devising distinctive “square within square” collage compositions, Jubilee and Rooftop (2008), which recycle printed pieces of yellow and white telephone book pages. Unity (2008), a spiral collage of punched holes from the pages of a Singapore telephone book, transforms the commonplace into something that suggests a beaded necklace or a strand of genetic DNA. According to the artist, these works from her Belonging series address identity and mobility, since phone books bear both individual and collective traces of the inhabitants in countries where she has lived. For Elizabeth Duffy, the security patterns found inside standard business envelopes prompted her to make striking graphite designs. A red-patterned envelope inspired the ricelike pellets that look like tiny insects swarming from the edges to surround the “barred window” in % APR, 2004 ;while in another drawing, she used graphite to emphasize the elegant columns of horizontal bars on a blue- patterned envelope (2005). Three artists deftly exploited the fluidity of ink or watercolor. In his stunning abstraction Red and Blue Swirl (1979), which displays his brilliant command of the watercolor medium, Robert Schwinger boldly brushed sweeping arcs of light blue (more transparent) and dark blue (more opaque) across a sheet of paper; he accented the spaces in between with bright orange-red. In his Sea Drawing/Pacific and Atlantic Ocean (2006), Martin Zet ceded control for the final outcome of his ink drawing to the splash action of waves at the beach. This unpredictable intervention caused his ink applications to “bleed” and splatter in pleasing ways he could not anticipate. In Port View, Roof (,2006) a graphite and ink drawing on mylar by Elise Kaufman, it is the turbulence of the gray sky that dominates her Red Hook scene. Bold shapes are the primary feature in several drawings. Julie Gross’s colorful gouache abstractions address the interplay of hard-edged, unmodulated, globular figure/ground forms. Debra Pearlman’s Pregnant (Pause) of 1996 presents a dense black charcoal hole/object shaped like a bicycle seat against its white background. A large yellow orb encroaches on the scene at left in Stephanie Brody-Lederman’s (The Winter Road) Snow (2005). In Untitled, Karni Dorell crowds miniature dark-veiled figures within an imaginary border to define a circular shape. Gloria Holcuprda-Williams’s handmade-paper and mud-“paint” piece conjures a singular, somewhat ominous, dark personage with white eyes peering out of a black hood. 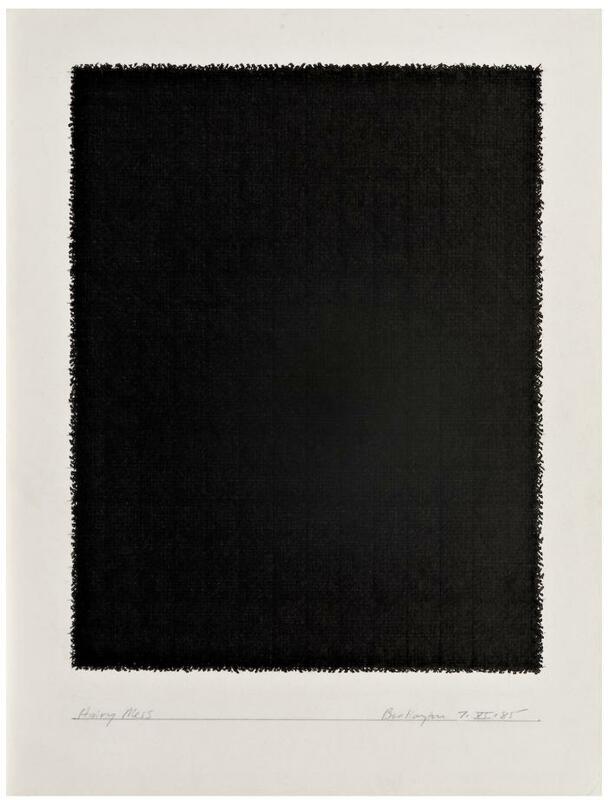 Nancy Manter’s Avalanche Index #1 (2006) juxtaposes intriguing textures in varying densities: a row of pitch black square patches beneath a ropelike line play against a black-speckled, brown-stained background. / In the 1920s the Dutch modernist Theo van Doesburg proclaimed, “Nothing is more real than a line, a color, a surface.” This became a fundamental rational for abstract art, which, he believed, “has no other significance than itself.” As this remarkable selection demonstrates, contemporary artists are making drawings that challenge what is real or abstract as they explore new expressions of line, color, surface, as well as… degrees of density. 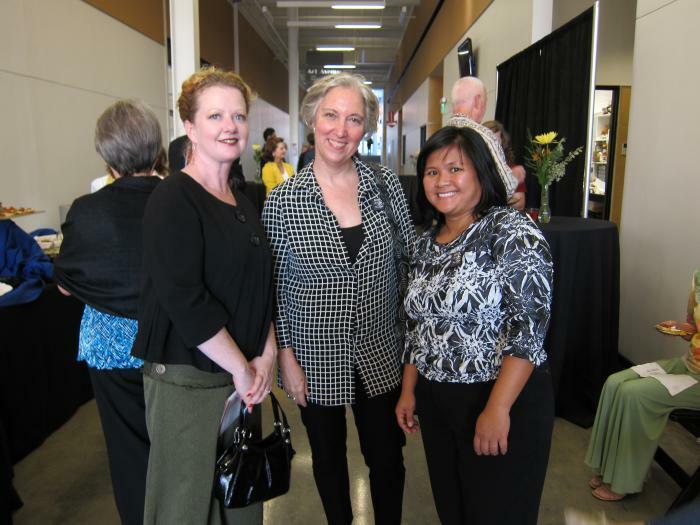 - Marilyn Symmes is Director and Curator of the Morse Research Center for Graphic Arts, Jane Voorhees Zimmerli Art Museum at Rutgers, The State University of New Jersey.